Glasgow Punter: The Submarine Time Machine. Since in was established in 2006, the National Theatre of Scotland has made a virtue out of being a theatre company not based in any theatre. This has led to a variety of imaginative and site-specific productions, and ensures that they endeavour to entertain all of the nation. "Theatre without walls" as they at times describe it. After a decade of renting storage and administrative space, National Theatre of Scotland has recently opened their new headquarters at Rockvilla, on the banks of the Forth and Clyde Canal. (For more on the area see this blogpost on Possilpark, Lambhill, Cadder and Ruchill). With Glasgow Sculpture Studios in the nearby Whisky Bond building, and Scottish Opera and the Royal Conservatoire having premises nearby, this former industrial area is being actively rebuilt as a cultural hub. To mark the occasion they produced a weekend of performances along and on the canal, riffing on the history (real and imagined) of the area. 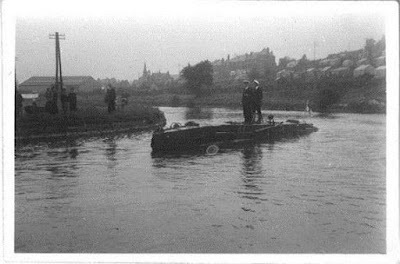 Under the banner "Submarine Time Machine" a promenade along the canal banks from Firhill Basin to Speirs Wharf could take in twelve to thirteen 10 minute acts, starting or ending with the aforementioned submarine. This follows the curious tale of a mini-submarine that passed through Maryhill in 1952, travelling along the canal to Rosyth to be de-commissioned. For the purposes of the entertainment a barge had been lovingly rigged up as the submarine, and could take the audience on a short, imagined trip. I meandered between the various performers with my daughter and could dip in and out as we fancied, others came along with their dogs, in groups or alone. Usually performed in rhyming couplets some acts were more successful than others, but were always engaging and imaginative. We had a choir accompanying a sad story of a deer trapped upon the frozen canal, a solo performer (who was my daughter's favourite) telling us about a fairy who had lost her wings, and at Firhill stadium a video of a promising young troup of young artisans re-enacting Partick Thistle's famous victory over Celtic in the 1971 League Cup Final. In Firhill, the pie stand was open for snacks, and you could either watch a video of the re-enactment, or you could sit in the empty stands and listen to the commentary of it all. I was in attendance at the match when the theatre company filmed it at half-time. They were unfortunate that Partick Thistle were 5-0 down in an end of season game against Celtic at the point the fan-actors emerged from the tunnel. On another day, with a different score unfolding, the crowd would maybe have been in a more light-hearted mood and entered into the spirit of it a bit more enthusiastically. Seeing it as part of this production though, I have to say I was impressed with how they managed to pull it all together. Further along, those performing the piece about the boy who pulled the plug out of the canal deserve special mention for their energetic efforts. The other piece I liked was the story of the Incredible Glesga Doo, alongside the pigeon loft near Firhill. When I lived in Maryhill I looked down onto the canal from my bedroom window, and I could watch people crossing the bridge over it late at night on unsteady legs. In those days, before it was cleaned out and made navigable again, it was full of discarded washing machines and cars. This weekend it was filled with tall tales, dance, songs, performance, wartime reminiscence and a general farrago of nonsense which made for a very enjoyable two hours spent walking along the canal. If you want to come back to see yet more dramatic performances along the banks of the Forth and Clyde Canal remember that you don't need to wait for National Theatre of Scotland to organise it. The football season starts on the 5th of August. The next performance of "Partick Thistle 4 Celtic 1"? Well, Celtic visit Firhill on 12th August 2017, come along and see what happens. Under-16s go free, entertainment often available. Partick Thistle 4 Celtic 1. Next performance? Tony Allen - "Tribute To Art Blakey"